Goodreads Summary: Humans and androids crowd the raucous streets of New Beijing. A deadly plague ravages the population. From space, a ruthless lunar people watch, waiting to make their move. No one knows that Earth's fate hinges on one girl... Cinder, a gifted mechanic, is a cyborg. She's a second-class citizen with a mysterious past, reviled by her stepmother and blamed for her stepsister's illness. But when her life becomes intertwined with the handsome Prince Kai's, she suddenly finds herself at the center of an intergalactic struggle, and a forbidden attraction. Caught between duty and freedom, loyalty and betrayal, she must uncover secrets about her past in order to protect her world's future. When I first heard about Cinder, I wasn't sure that it was something I would want to read. Cinderella meets cyborgs? It seemed a little out there. But after hearing so many good things about it, I decided to give this book a chance, and I am so glad that I did. Cinder is an incredibly inventive spin on a fairy tale and one that will keep you captivated from beginning to end. Cinder is nothing like your usual fairy tale retelling. The basic tenets of Cinderella are there - the wicked stepmother, stepsisters, a prince, a ball - but the similarities end there. Cinderella was merely a starting point for Marissa Meyer; she expanded the tale into something new and wonderful all on its own. I really enjoyed Cinder's character, cyborg nature and all. Then again, I really enjoyed all of the characters (wicked stepmother and stepsister aside - those two I wanted to strangle). And Iko, even if she was an android, was such a great best friend. I loved how this story had multiple layers, encompassing not only Cinder's struggle with her family and the plague research but also political crises and the hardships that Prince Kai had to endure. Because Prince Kai...who wouldn't want a prince like that? He loved his people and was so dedicated to doing what was best for them. From family tragedy to political unrest he had to deal with more than any teenager should. And yet, with his kindness, he completely won my heart just like a real prince should. There are many surprising twists and turns along Cinder and Kai's respective journeys, though one important plot twist is fairly obvious early on in the story. Despite that, the many layers and especially the sci-fi elements kept me intrigued and made it nearly impossible to put this book down. The only thing I did wonder about was the setting - it seemed that New Beijing could have just as easily have been any other city if the Chinese names and appellations had been omitted. Because I love foreign settings, I was slightly disappointed by the lack of vivid setting, but everything else in the book more than makes up for that. 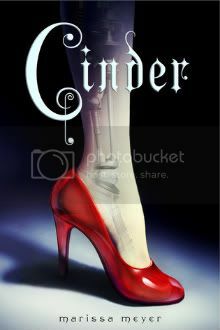 Cinder is a great debut novel from Marissa Meyer and one that will keep you turning the pages because you just have to know what happens next. I can't wait to read the next book in the Lunar Chronicles! This has has been sitting on my book shelf for a long time, an ARC copy by the way. Great review, I'm going to try and read it soon. I think this will be one of the strongest debuts of 2012. I really, really loved it and I can;t wait for book 2! !